1. 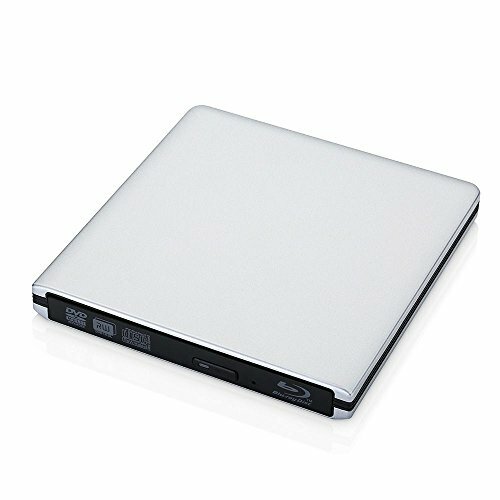 Powerful Functions;This external ODD device is a player&burner;With great internal chip, this allows to read 3D Blu-ray disc,CD, CD-R, CD-RW, DVD-R,DVD-RW, etc and write CD, DVD, etc;It is easy for you to watch 3D movies. 2. USB3.0 Technology;With USB3.0 port and strong error-correcting ability, faster data transfer;It is also backwards compatible with USB2.0 and USB1.0;Compatible with notebook, laptop, desktop and other computers with USB port. 3. Simple Operation;Plug and play,powered by USB port;No driver needed;Just plug it into computer and it will be detected;Enclosed with two USB cables, USB3.0 is used for data transmission,USB2.0 is used for supplying extra power, which ensures to supply sufficient power, read&write discs more fluently. 4. Support Boot USB CD ROM. With this CD/DVD burner, you can install system by yourself ( can not used to install Apple System);Compatible with Windows 98 SE, ME, 2000, XP, Vista, Win 7, Win 8,Windows Server 2003, 2003 R2, 2008, 2008 R2, 2012, 2012 R2, Mac OS 8.6 and above. 5. High Quality and Compact;Advanced aluminum alloy outer case, which is robust and strong enough to withstand abrasion and corrosion;Grinding process finish surface, sleek and fashionable design;Lightweight, and easy to carry.